Raghavendra (10/30/2012 1:03:39 PM): will cut the qty. kailash123p@yahoo.co.in (10/30/2012 1:04:51 PM): ?? Flat to positive opening is expected with selling pressure at higher levels .we may see few fresh entries as 5600 at spot was extend nice support yesterday after 12 noon and able to hold Nifty spot there for more than 3 hours. Sell on rise & book profit at low as break down spotted on eod chart...60 points range trade of almost 20 sessions break its range with volumes see at 30 minutes chart ..
kailash123p@yahoo.co.in (10/30/2012 9:44:04 AM): sl for 5900 call is 16.90 advised to buy at 22 now trading at 25.25 u can book at ur comfort or hold for strangle ..
Just pay Rs1000/- for 1 week and enjoy premium calls, news letter ,counselling ,guidance ,trading concepts /ideas. 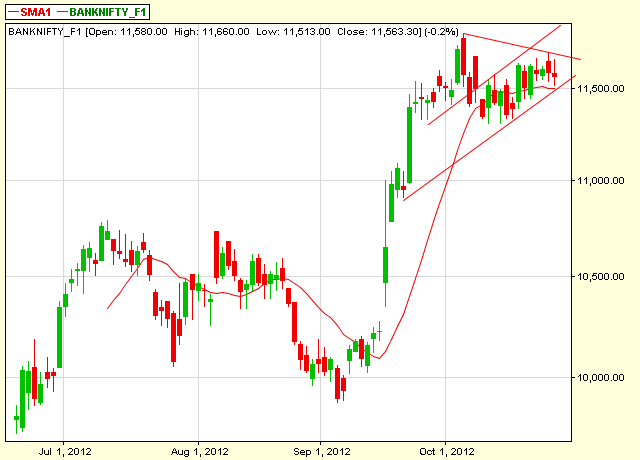 will it be break out or break down ?????? 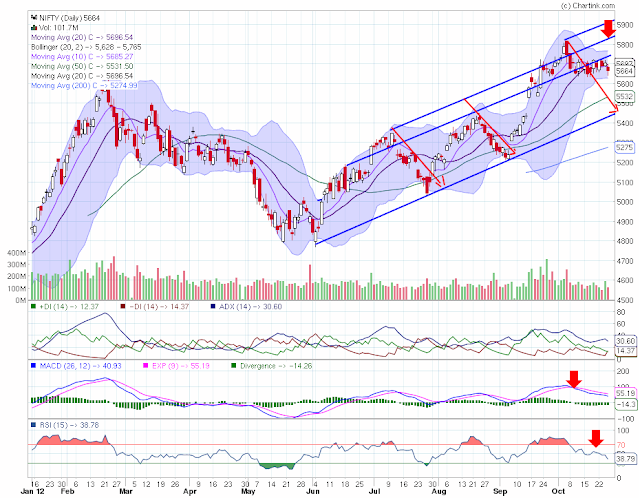 Technical indicators are indicating for break down ...yesterday Nifty closed its shop making Doji at eod chart .spotting head and shoulder pattern and descending triangles. 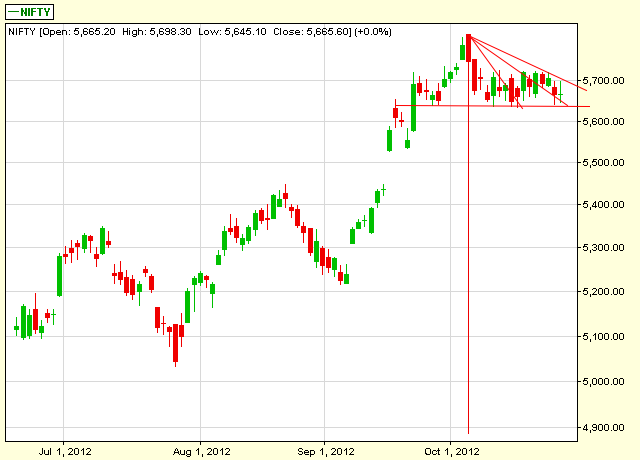 a large gap is lying at 5450 5525 which is inviting bears to attack . 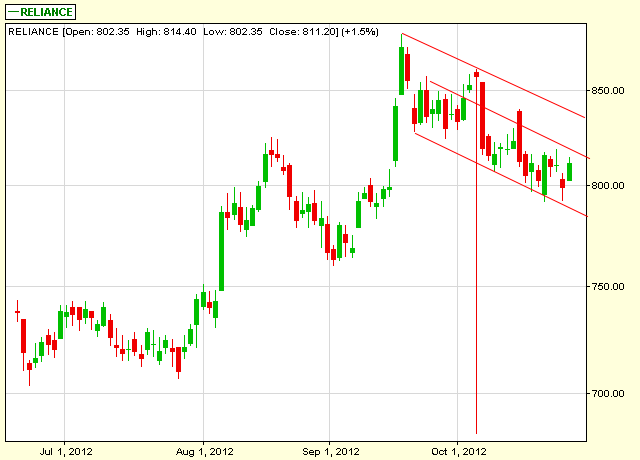 Reliance is trading in falling channel ...will it break upper falling trend line today ? 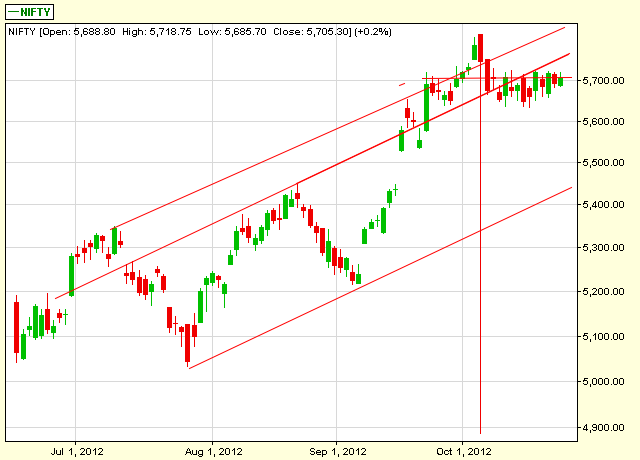 Bank Nifty trading in channel .trading in range and squeezing in cone .. Always place exit /profit booking order in system when you are in trade . Never expect too much from market . Never love or hate the stocks . Goutham: Commodity Alert: US markets floor trading will remain closed due to Hurricane Sandy on Monday and Tuesday. Goutham: Monster Storm Targets Eastern U.S. : Hurricane Sandy looms over the northeastern U.S., triggering evacuations for hundreds of thousands of residents, the cancellation of more than 7,700 airline flights and the mass closure of schools and public transit systems. Nifty spot may trade in range today too..range may be 5640 -5720...RBI credit policy to be announced on 30 th Oct 12..Market is waiting for it to break its range . Positive to gap up opening is expected with stock specific moves. Profit booking at higher levels can not be ruled out so sell at swing highs and book profits at swing lows . 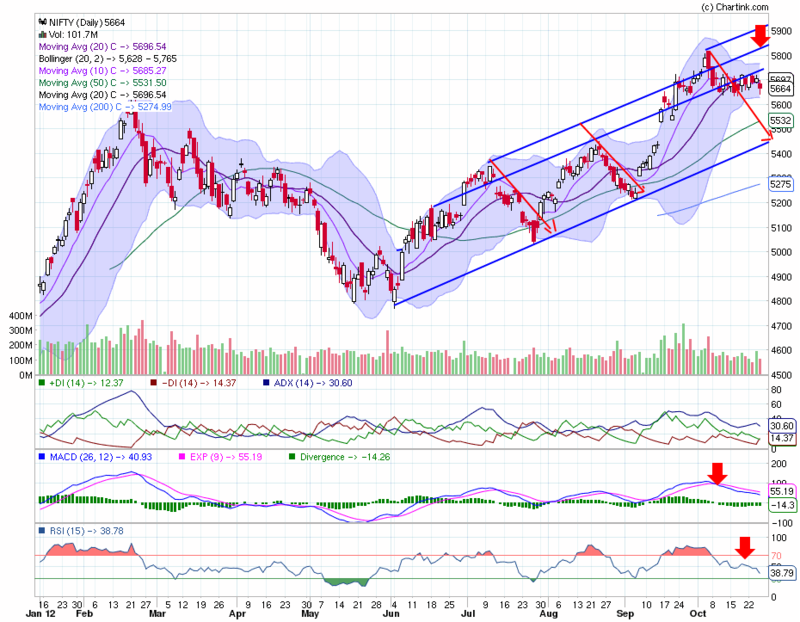 Nifty daily chart is slowly turning bearish and expecting trend line support at 5450.
positional traders may plan their trade for a target of 5450 with stoploss of 5755 closing basis if nifty close below 5700 on Monday . 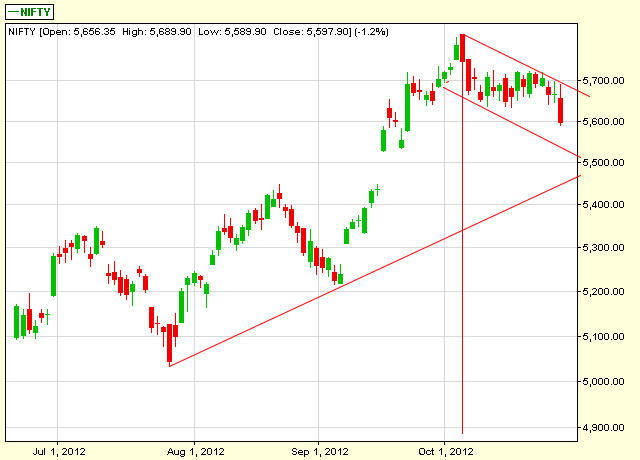 Go long above 5720 for the target of 5950 if sustains above 5730 .stoploss 5660 closing basis. Will you make 2000/- to 10000/- on 1 future lot trade in a day on these calls ? just pay 1000/-for full 1 week and roll over to next week on satisfaction . Raghavendra (10/26/2012 8:25:49 PM): what a statement Kailash sir? Raghavendra (10/26/2012 8:31:03 PM): Thanks guruji! kailash123p@yahoo.co.in (10/26/2012 10:23:16 AM): have u traded ktk bank 135 to 133 ? kailash123p@yahoo.co.in (10/26/2012 12:05:12 PM): what u will say it sheer bad luck na....if i m opting wide sl traders are complaining i m planning wid sls ...if opted short sl it got triggered and trade turned in my direction ...idfc planned sl was 160.20 today's high 160.25 now trading at 159.45 .......any suggestion now ?? Positive to gap up opening is expected with stock specific moves and profit booking at higher levels can not be ruled out ...we may see spot nifty at 5660 70 ...be cautious. .
FIIs were net sellers in yesterday . Hero MotoCorp, the largest two-wheeler manufacturer in India, has reported a 27 per cent decline in net profit to Rs 440.58 crore in the July-September quarter, as sales dropped on slowing demand and tough competition. The two-wheeler market in India has witnessed the adverse impact of the economic slowdown, rising fuel costs and relatively high interest rates. Hero’s sales, on the other hand, have been impacted due to a strong push by its previous partner Honda Motor Co, which has been trying to get a strong foothold in the Indian market after it broke up with Hero last year. kailash123p@yahoo.co.in (10/25/2012 12:55:57 PM): 5700 calls 68 lac pe 72 lac pcr 1.2 means bearish ..